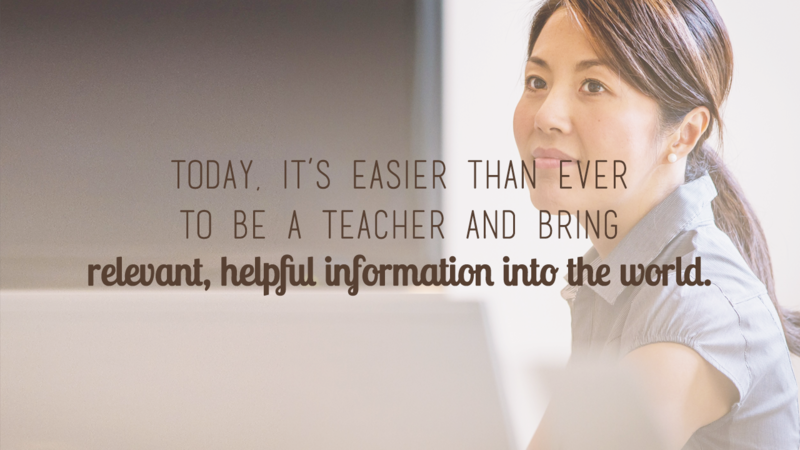 With the prominence of social media today and tools like Facebook Live, it is now easier than ever to be a teacher and bring relevant, helpful information into the world. So many people are doing live video, some about as useful as a romance reality show, but if we are to get great benefits and not just entertainment from live video, it is up to those of you with great content to have the courage to share. Now I know a lot of us may find ourselves thinking: "What do I have to share to the world? Nothing." The thing is, you do have great content and information. You just don't realize it. Right now, there are people out there who need to learn about topics you’ve already mastered. You aren't the same person you were five minutes ago. You're constantly growing and taking in information, and it's up to you to go out there and share what you know! Teach them the things you've learned, the things you've picked up over the course of your journey! If you've just figured something out yourself, why not share your discovery with others? Here's an example: one of my good friends did a Facebook Live session recently on how to make a flower arrangement. She has to make flower arrangements every week for her job. It's what she's good at and what she's knowledgeable about. And you know what? The session was amazing. It was chock full of information for people who might want to try arranging flowers themselves! I could make a nice little centerpiece arrangement all on my own now and all I did was watch her short video! Some other things I've seen going on around Facebook are videos on how to make protein balls, how to knit and crochet, tips on co-parenting for people who have gone through a divorce. The range of topics is wonderful and you're always learning new things so there are always new things to teach. Personally, some of the things that I know I'm good at and will continue to teach on are effectively using LinkedIn as a networking tool and connecting with people you have a lot in common with for collaboration. I love being an executive administrator and I adore helping people hire assistants and teaching assistants how to work better with the people that employ them! I also like setting up businesses, from buying domain names to setting up an organized foundation for saving files and information. Those are the things I'm going to continue to teach. Am I an expert in all things business, no, but that’s just it - no one is! Simply share what has worked for you. Everybody feels uncomfortable when they first start teaching. The thought "Who am I to teach?" becomes persistent. It holds you back. You feel vulnerable because you're putting yourself out there. You have to remember that in the big scheme of things, who are you not to teach? Other people need the information you've figured out already! Get out there and get vulnerable with me and share what you know with the world!